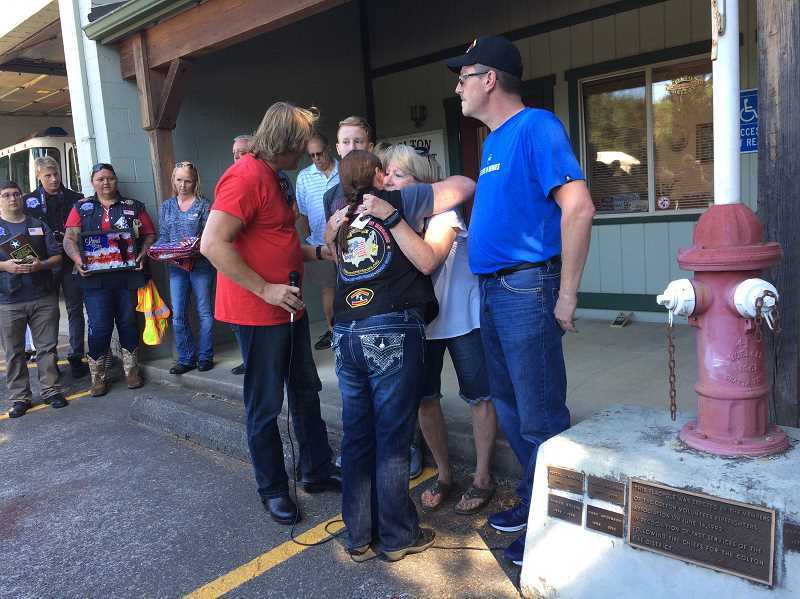 Close to 100 people met at the Colton Fire Station to honor David Wayne Johnson-DeFord. The tribute was scheduled and put on by Tribute to the Troops Oregon, the first official chapter of the organization on the West Coast. Johnson-DeFord was born in Oregon City, but spent most of his life in Colton. Shortly after his graduation from Centennial High School in Gresham, he joined and served in the U.S. Army from 1987 to 1991 and left with an honorable discharge. His family has served in conflicts since the Revolutionary War, according to the family, he rejoined with the Oregon National Guard after Sept. 11. "'This is something I have to do,'" he told friends and family. His mother told the Pioneer she wondered if she should stop him, but she didn't, "because you have to let them go sometime." His brother Randy Johnson noted that his brother's friends in the National Guard worried that terrorists would come to Oregon and cause death and destruction. Rockie Lynne, country music star and spokesman for Tribute to the Troops, spoke to the large crowd, including a number of bikers as well as other Gold Star families. He gave a history of Johnson-DeFord's life noting he was smart, funny, headstrong, stubborn and had a kind heart. "He was crazy about music, loved Judas Priest and Ozzie Osbourne was his very favorite. He was a good student and when he paid attention, he was a great student. He was well-liked by everyone. When he first went into the Army, he became a cook. When he got out in 1991, he worked in restaurants around the area and in Portland," Lynne said. He later told the Pioneer he'd spent a full month learning everything he could about David Johnson-DeFord. "I spent the last month researching his life." He also is visiting and honoring five other families this weekend. One area that Johnson-DeFord really loved was motorcycle racing, where Lynne said he got the nickname Snow Monkey. When he rejoined the Army, Blackwater and Haliburton and other non-governmental groups in Iraq had taken over the cooking. "So David was retrained to be a gunner," said Michelle DeFord, his mother. "Gunners traveled with supply convoys in either the first or the last Humvee, according to his mother. Enemies typically would hit either the first or last cars. David had volunteered for the mission, he took another's place and was in the final car when he was killed by an improvised explosive device detonated near his Humvee." His fellow soldiers describe him as "…the type of individual that would be there for you no matter what. He constantly had a good thought, a happy word and a cheerful grin," she said. Lynne called him a "recruiting poster soldier who mentored the younger soldiers like a father." 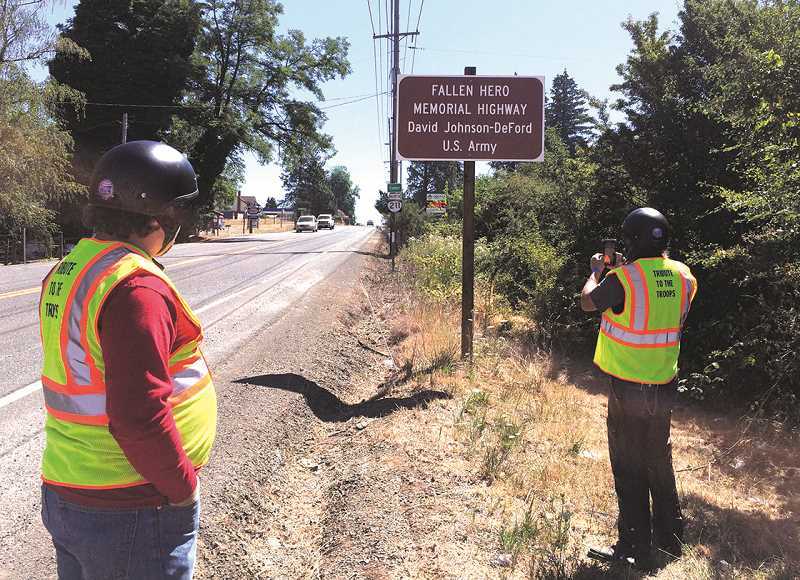 Michelle DeFord said as she comes up the hill on 211 to Colton and sees the sign that was authorized by the legislature stating his name as a fallen hero, "It [the sign] makes me proud. He grew up here and his friends still live here. I'm happy it's here." The bikers, many of whom are veterans from recent conflicts as well as the Vietnam War, lined up to pay their sympathies to the family. It was a long line. Tribute to the Troops began when a Gold Star family wanted to honor and show respect for other families with fallen heroes. They formed the first inaugural motorcycle ride in September 2011, which turned out to be the spark for several Oregonians to push for an Oregon chapter. "The chapter's members come from all walks of life with a common desire to honor our fallen heroes and show support for their families," according to their website. Lynne, who is also a country-western star, headlined the benefit concert, dinner and auction event to honor the six fallen heroes on July 28 at the ballroom of the Red Lion in Salem.